DETROIT -- U.S. safety regulators are demanding that automakers and Takata Corp. expand nationwide a recall of vehicles with certain driver's side air bags equipped with inflators that can erupt and send metal fragments into the passenger compartment. Previously, cars with the inflators have been recalled only in areas along the Gulf Coast with high humidity. The National Highway Traffic Safety Administration says it's basing its latest decision on an incident that happened outside of those areas. The owner of a 2007 Ford Mustang recently complained to the government about suffering an injury when an air bag malfunctioned in North Carolina, outside of the recall area. The safety agency says if Takata and automakers don't agree to the recall quickly, it will use its legal powers to make sure the inflators are recalled. "We now know that millions of vehicles must be recalled to address defective Takata air bags and our aggressive investigation is far from over," NHTSA Deputy Administrator David Friedman said in a statement. On a conference call Tuesday, Friedman told reporters Takata has indicated they will not comply. "Takata's initial response is an unwillingness to move forward," Freidman said." And frankly, that is one of the reasons we are talking to you today because everyone needs to understand that Takata needs to act." The safety agency has been under intense pressure from lawmakers to seek an expansion of the recalls beyond the Gulf Coast states, Hawaii, Puerto Rico and several other U.S. territories. Friedman and others have been summoned to testify before a Senate committee on Thursday. Takata has said that in areas of high humidity, airborne moisture can cause the air bag propellant to burn faster than designed, causing the problem. Last week, Takata was subpoenaed by the U.S. District Court for the Southern District of New York after reports that the company knew about the air bag problem 10 years ago but covered up the results of secret test. Two former Takata employees told the New York Times the testing was stopped after three months, and the evidence destroyed. 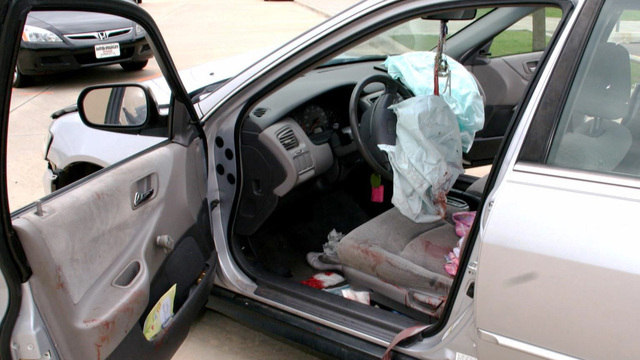 NHTSA's demand for a national recall does not cover passenger side air bags, at least not yet. The agency says it has been pushing the auto industry to do tests to make sure current recalls cover all air bags that are defective. The Senate Committee on Commerce, Science, and Transportation has scheduled a hearing on the defective airbags for Thursday. Representatives from Takata, Honda, and Chrysler will testify, along with Stephanie Erdman, who nearly died when her airbag explodedwho nearly died when her airbag exploded. "Every day, when I look in the mirror, I can still feel that piece in me," Erdman said. "I have no idea how I kept my eye. It was a miracle." The safety agency has also been investigating Ford after receiving a complaint on Oct. 30 from the driver of a 2007 Mustang. In that case, the Mustang was going 35 mph when it crashed into the rear of another vehicle in North Carolina, causing the air bag to deploy. A metal fragment from the air bag injured the driver's leg. The Mustang crash, which happened on Aug. 17, was notable because it occurred outside of the previous recall boundaries. North Carolina doesn't have the high level of humidity of Florida and other Gulf states. On Monday, The Associated Press reported that Honda was quietly fixing air bags across the nation if customers were concerned about their safety. So far, Honda has formally issued recalls in 13 states and territories. In October, NHTSA posted this list of vehicles affected by the recall, urging owners to "take immediate action." The safety agency has asked automakers for a complete list of their vehicles that have Takata air bags.